I love cheese. I think I could pretty much live off of any variety of cheese with some bread and fruit. Yum, that would be a life. My favorite cheese are the creamy triple cream Brie and Camemberts of the world. Apparently one of the best appetizers at our wedding was the baked brie platter. Although we did get a plate full of samples from all of the other appetizers the caterers neglect the cheese. My non-sample of this baked brie was my closest experience to this recipe. I always try to eat cheese at room temperature. I also have been known to put my creamy cheese in the microwave briefly to soft it up. I have never however, had cheese wrapped in puff pastry. This weekend that changed. There are plenty of ways to have baked brie. You can use puff pastry, like I did or pie crust. You can have it plain or topped with a fruity jam. We picked homemade blueberry jam and then topped the whole thing with honey. This was too easy to put together. I will be tempted to make this for dinner in the coming months. Preheat oven to 350 degrees F. If you want, start with chilled brie and use a sharp knife to carefully cut off the thin top rind of the cheese. This may help the crust stay with the cheese when served. The rind is edible so you don't have to do this step if you don't want to. On a stick-free cookie sheet, lay out the puff pastry flat; put the brie round or wedge on top. 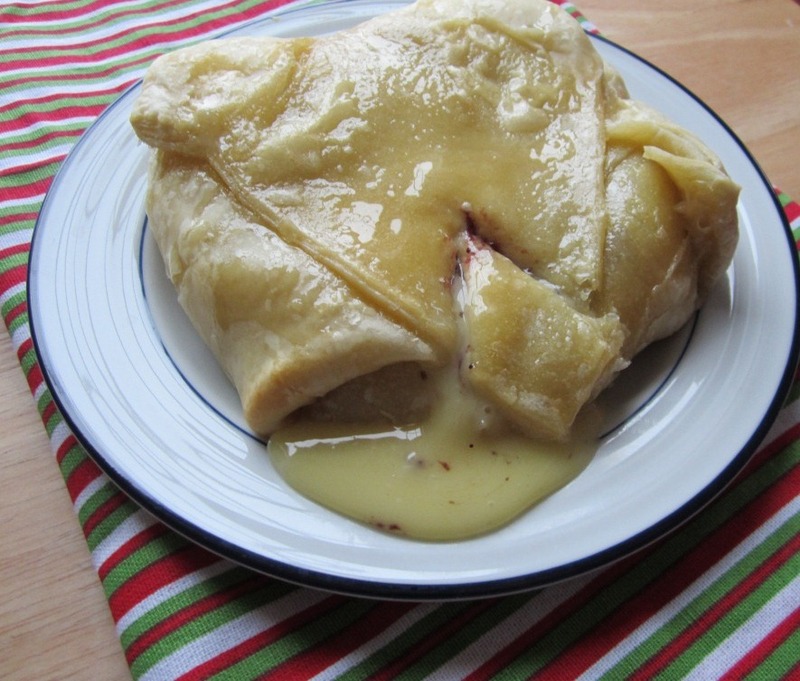 Spread jam on brie, fold dough over top, cutting off excess dough. Drizzle honey and place a handful of brown sugar on top. Is there anything better than baked brie?!! !